NEW BOOK-CD SET NOW AVAILABLE! Now also available as an audiobook from Oysongs.com. The Jewish Review wrote: "If you are looking for a book to inform and educate, this is an excellent read. If you are looking for a mind that will startle you, this is a must read." the two CDs add an even greater dimension. Click the "Buy Now" button to order securely over the internet with your credit card. Jewish Music As Midrash: What Makes Music Jewish? is Michael Isaacson's uniquely engaging way of answering this question, using both sides of his and our brains. After discussing the issues central to each facet of his comprehensive definition, the composer then offers us his own Jewish music compositions (more than 30 recorded examples on two companion CDs) to guide us along the creative process culminating in the work. 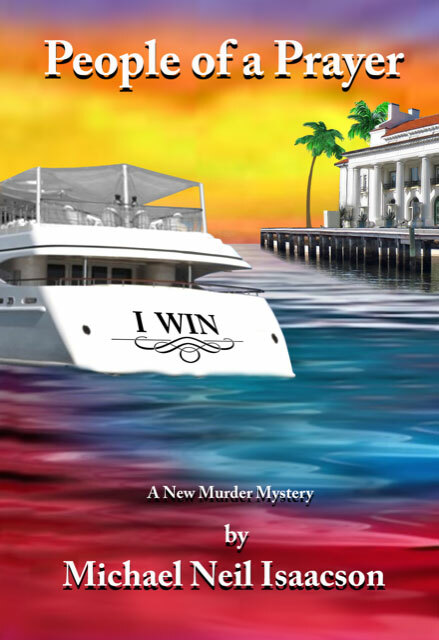 - The book that everyone is talking about! - An original concept of Jewish music as midrash that can be applied to many other forms of non-literary, artistic creativity as well. Michael Isaacson, who received his doctorate from the Eastman School of Music and rose to great heights in both Hollywood and Jewish music, challenges and rewards the reader at every turn in his new book. Isaacson leavens deep levels of scholarship with humor, warm-hearted remembrances and one charming anecdote after another. The reader cannot help but be dazzled by Isaacson's erudition. - An essential read for anyone interested in Jewish or sacred music. Bulk discounts for classes available. BRING MICHAEL ISAACSON TO YOUR COMMUNITY! Schedule Dr. Isaacson for a lecture and book signing. E-mail eggcreamer@sbcglobal.net or call 561-877-8638 for more information. Dr. Michael Isaacson's work is of the highest quality. This book seems to extend that quality not just to music, but to writing about music. It is a genuine contribution to the field. If anyone knows Jewish Music today it is Dr. Isaacson and this book is a testament to his prodigious knowledge and skill. This is a wonderful book. Michael Isaacson combines a life time of compositional know-how with an informed understanding of Jewish literary midrash to tackle the questions of authenticity and innovation in Jewish music. He offers us valuable tools with which to listen, understand, and remember much of the music that defines our Jewish lives. Dr. Isaacson's experiences creating effective dramatic music for live theatre, television and film come into play to clarify issues in worship music. Jewish Music As Midrash: What Makes Music Jewish? is a profoundly original book that has few models preceding it but is certain to set a course for sacred artistic studies well into the future. Michael Isaacson's analytic observations of synagogue music past and present and his vast accomplishments in composing sacred, secular, and media music combine to offer the reader and listener a privileged view of where Jewish music has been, where it is today, and where it has the potential of developing in the future. This is a book that is sure to benefit Jewish and non-Jewish professionals, lay-persons, and all who are fascinated with the stimulating question "What, in fact, is Jewish music?" The two CDs of Isaacson's midrashic musical examples, which are included, are more than worth the price of the book alone. Although the subject of synagogue music has been explored in numerous books, the composer’s voice is conspicuously scarce. When this insider’s perspective does appear in a bound volume, it almost always comes in the form of an anthology, such as the collected writings of Abraham W. Binder (1971), Herbert Fromm (1978) and William Sharlin (2008). Especially rare—and especially valuable—is the composer’s book that follows a logical sequence of chapters, tackles a central theme and develops a sustained argument. 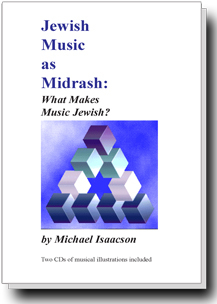 Perhaps the only publication of this kind is Michael Isaacson’s Jewish Music as Midrash: What Makes Music Jewish? Isaacson, whose credits include hundreds of compositions and fifty recorded albums, is among the most renowned contemporary creators of Jewish sacred song. His thoughtful and inventive treatment of texts, which he calls “musical midrash,” is outlined in fifteen lucid chapters combining music theory, personal anecdotes, professional observations and various sources of wisdom. CLICK HERE to read the full review.